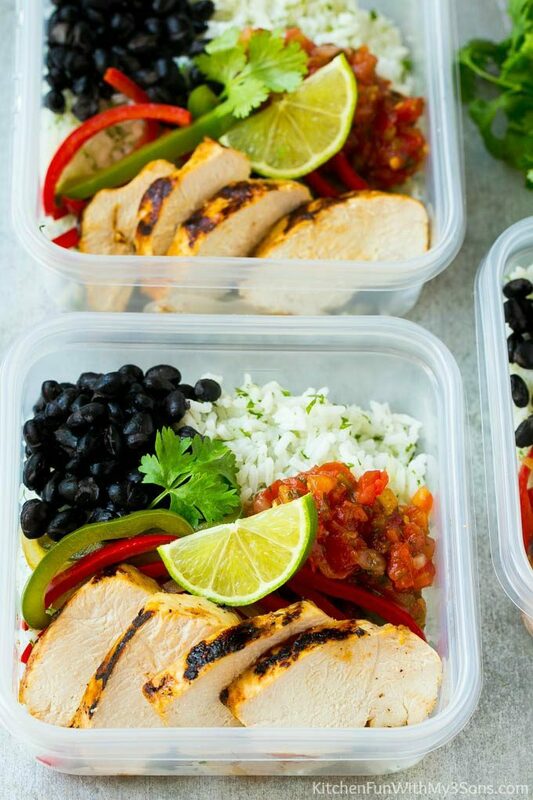 These chicken fajita meal prep bowls are loaded with marinated chicken, colorful veggies, black beans and cilantro lime rice. An easy and healthy lunch option and it makes a great family meal too! In a large bowl, whisk together the ⅓ cup olive oil, lime juice, sugar, 1 teaspoon salt, ½ teaspoon pepper, chili powder, garlic powder, onion powder and cumin. Add the chicken breasts and toss to coat. Cover and refrigerate for at least 20 minutes or up to 8 hours. Preheat a grill pan or large frying pan over medium heat. Place the chicken in the pan and cook for 5-7 minutes per side or until cooked through. Cook time will depend on the thickness of your chicken breasts. Remove the chicken from the pan and wipe out the pan with a paper towel. Place the chicken on a plate and cover with foil. Add the peppers and onions to the pan along with 1 tablespoon of olive oil. Season with salt and pepper to taste. Cook for 5-7 minutes or until vegetables are browned and softened. Place the rice in a large bowl; add the lime juice and cilantro and stir until combined. Place ¾ cup of rice in the bottom of each of 4 meal prep containers. Divide the chicken, vegetables and black beans evenly among the containers. Add 2 tablespoons of salsa to each container. Garnish with lime slices and cilantro leaves if desired. Cover the containers and store in the fridge until you're ready to eat them, up to 4 days. To serve as a dinner main course, prepare as directed but skip the steps about dividing the food into containers.